This weekend at the fabric store I found this little piece of fabric in the sale bin, unfortunately its tiny and has no name. Was there a selvage edge with any info on it? Hey Bridgette, I wish there was, because I would have found it already. It was just the pattern, so I have nothing to go by. Okay, I've worked at a fabric store for 10 years and if I had to take a wild guess, it looks like a Greeff or Schumacher fabric? Good luck! Interior Design/fabric store and we have that fabric in one of our books. 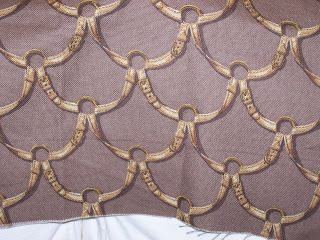 It is from Duralee fabrics #41973 col:556 cocoa/almond. HEATHER- THANK YOU SO MUCH!! You are my new best friend, seriously I have been searching and searching for this and could not find it. So, again THANK YOU!! omg i love it! and I love heather too for telling us how to find it!! so excited to see how it turns out! !